World Fair Trade Day is coming up on the 14th May. Whilst Fairtrade Fortnight offers the opportunity to celebrate all the certified FAIRTRADE commodities and the impact they have on farmers across the global, World Fair Trade Day offers an opportunity to recognise and celebrate the wider Fair Trade movement, including craftspeople as well as farmers – creating and trading goods through ethical systems right across the globe. 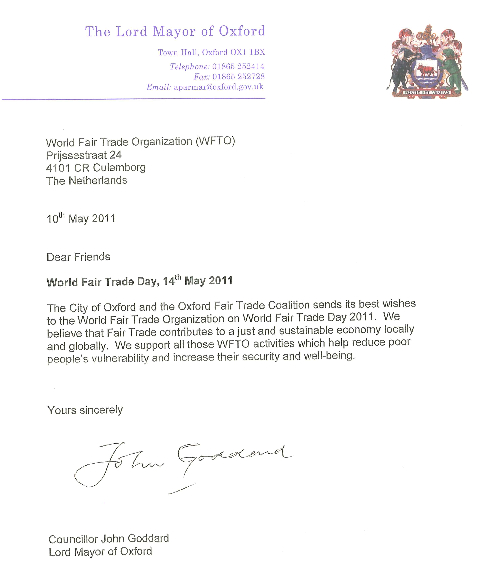 The city of Oxford and the Oxford Fair Trade Coalition sends its best wishes to the World Fair Trade Organisation on World Fair Trade Day 2011. We believe that Fair Trade contributes to a just and sustainable economy locally and globally. We support all those WFTO activities which help reduce poor people’s vulnerability and increase their security and wellbeing. The theme of connecting local and global economic sustainability and wellbeing is one we will be exploring when Oxford hosts visitors from a number of European Cities later this year, coming together as part of a project to find how local government and local communities can contribute to the realisation of the Millennium Development Goals. This entry was posted on Tuesday, May 10th, 2011 at 3:14 pm and is filed under Uncategorized. You can follow any responses to this entry through the RSS 2.0 feed. You can leave a response, or trackback from your own site.